Big and Small Rescue Society hasn't added a story. We are Big and Small Rescue Society. We help get abandoned and sick dogs back on their feet and into loving homes. We recently rescued two sad cases from a shelter. They were scheduled to be euthanized. Shasta is 1 year old Great Dane. She should weigh 110 + lbs, but she came to us a mere 72 lbs. She was so dehydrated that her skin just would not bounce back. She was dizzy on her feet. We were not sure she would make it. We hospitalized her immediately and put her on IV support. After 4 days, she was discharged and now begins the long journey to health. On the same day, we brought a very skinny shepherd we named Banff into our Society. He was emaciated and blowing green discharge out of his nose. He had severed kennel cough. He was so sad. He seemed unstable on his feet. He too was hospitalized for 4 days. We are asking our community to help us with the vet bills for Shasta and Banff. The totally for the vet bills incl tax is $1209.41. Fundrazr and stripe take a combine 8%, bringing our target to $1307. 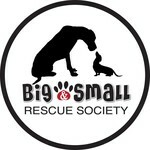 Big and Small Rescue Society hasn't posted any updates yet. Big and Small Rescue Society is managing the funds for this campaign. Big and Small Rescue Society is a verified organization.